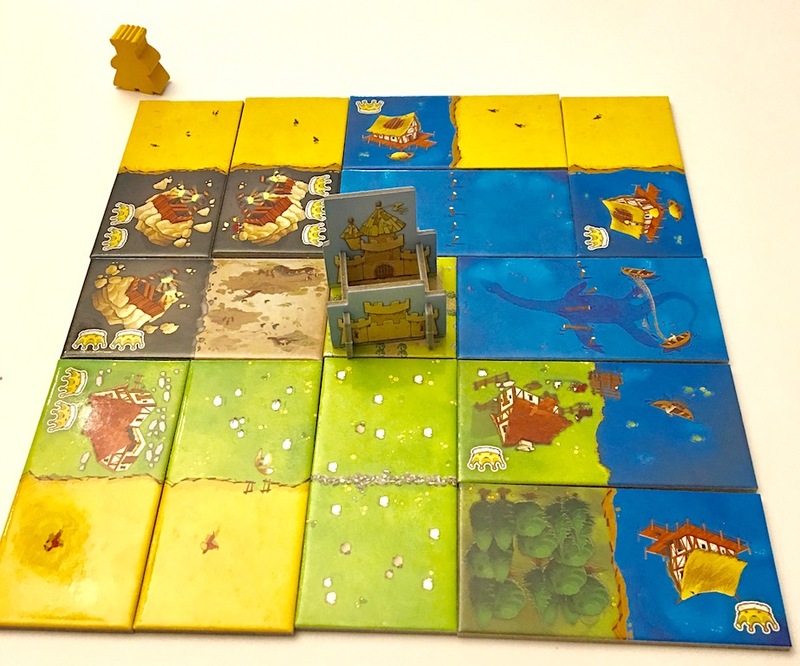 Kingdomino, as its name implies, combines kingdom-building with the simplicity of dominoes. Designed by Bruno Cathala and published by Blue Orange Games, Kingdomino recently won the 2017 Spiel des Jahres. Build your kingdom by matching domino terrains. Each round, players choose a new domino and place their domino that was chosen the previous round. The available dominoes are lined up in order, according to the value on the reverse side of each. Since turn order is based on the order of the previous round’s choices, players must weigh the value of taking a more desirable domino over getting the first pick next round. Placing tiles is simple: a new tile must connect to another tile, making a match on at least one type of terrain. Any tile may connect to the starting square, which is considered wild. Players continue to place tiles until they have completed their 5×5 square kingdom… or at least a kingdom that fits in a 5×5 square, since poor planning can create gaps that will force you to discard one or more dominoes. When all the dominoes have been used, each player should have a 5×5 square kingdom (or close to it; see above). Within each kingdom, there are different connected territories. Within each territory, players count the connected squares, and multiply that by the number of crown icons that appear in that territory. A territory that contains no crowns scores zero points. Once the scores have been tallied, the highest scoring kingdom wins. Kingdomino is a beautiful game, and simple to play. Gameplay is simple and relatively quick; most games take only 15-20 minutes, even including an explanation of the rules. Most players attempt to make large connected territories that also contain crowns, which is a good strategy, but only if one can claim the crowns matching their larger territories. Good players will also block others by forcing them to place undesirable dominoes. This provides a great opportunity to talk through strategy and teach younger players. 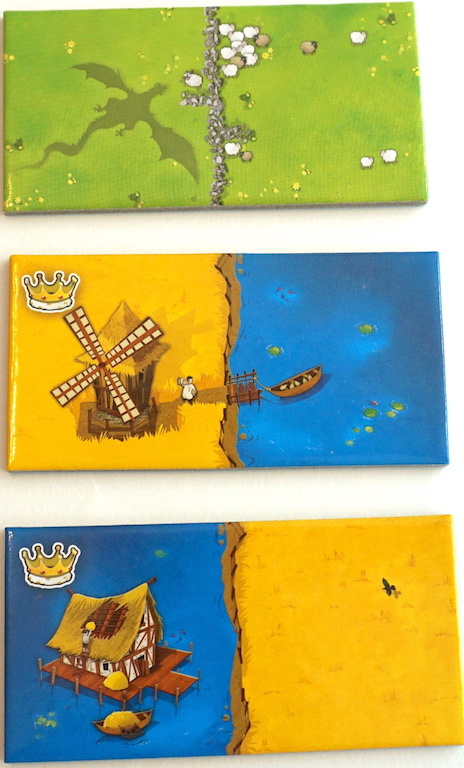 We love the artwork from Cyril Bouquet, who made every terrain tile slightly different. 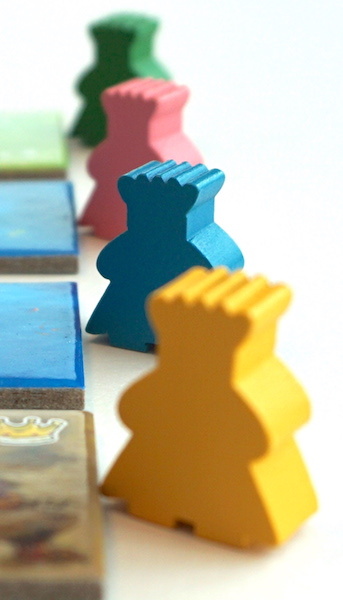 The special “king” meeple figures are cute, too. The game box itself is used as the draw-tray for the dominoes, which keeps them organized and not spread out all over the table. Replayability is high with Kingdomino. Because every board is built as you play from the dominoes selected, no two boards are ever the same. Blue Orange also ups the ante by offering a number of variants from the manual which keep the game fresh. Overall, the simplicity of gameplay, the multi-layered strategy, and the beautiful components make this a game that the whole family can enjoy. No reading is required and the math is straightforward, which helps Kingdomino transcend age and language barriers presented by many other games. Find the award-winning Kingdomino at your local game store or at Amazon. 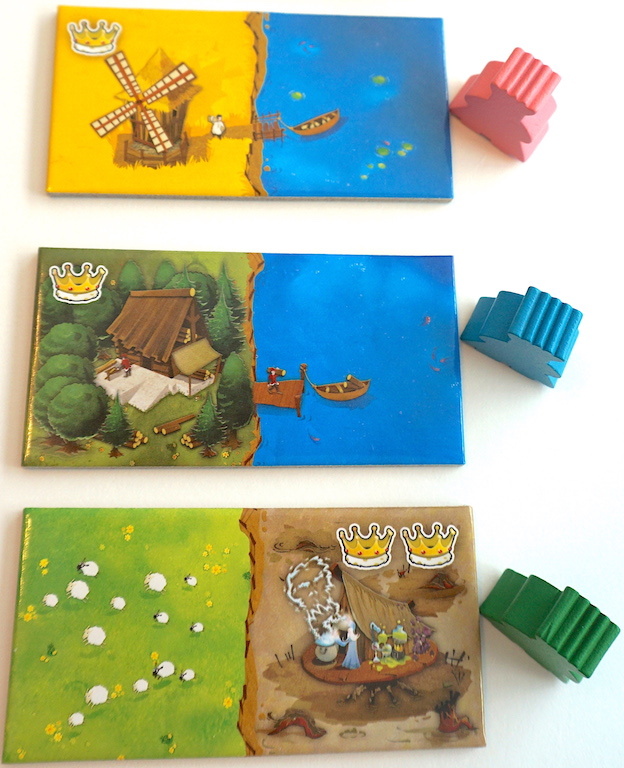 The Family Gamers received a review copy of Kingdomino from Blue Orange Games. We love this game! It’s such a great game for kids learning strategy and their multiplication skills. We have an almost 6 year old and a 7 year old that both play the game. The 6 year old just needs help with the scoring, but strategically he is able to tell what will bring more points, he even wins fairly often. Other perks are that it packs up small so it can travel well. The pieces are also well built and can endure the rigors of young children.